I know that many of you who read this will say I am going too far. But I cast my mind back to 1981 when I was on location in coastal Victoria, near Warnambool, for the acclaimed Women of the Sun series shown on SBS. (Read more: http://bit.ly/z13S4h) As the television critic for The Australian, I was there to interview the cast and crew of Episode 1, Alinta, The Flame, about the impact of the arrival of white men on the Nyari people around modern-day Portland and the Twelve Apostles. Two convicts are washed ashore on their tribal lands, and the subsequent “invasion” of other settlers – speared because they settled on land, not knowing it was sacred — leads to the massacre of the tribe by the “invaders.” Only Alinta, “The Flame,” and her child survive. I was shown the spot where the massacre took place on the beach below a cliff where the Aborigines were slaughtered and tossed on to the bloody shore. I stared at that cliff for what seemed like ages; I can still picture the carnage. Surely that spot deserves a memorial as well. There are many memorials in the United States to the nation’s Aborigines – the American Indians, who like their Australian counterparts, fought a losing battle against the white settlers. Perhaps the most interesting, and poignant, is the Little Bighorn Battlefield National Monument, originally called the Custer Battlefield National Monument, named for the loser of the battle against a group of Cheyenne, Sioux and Arapaho warriors in Montana. Lt Col George Custer and 262 soldiers, scouts and civilians attached to the 7th US Calvary died in the fight, known as Custer’s Last Stand, on June 25, 1876. Fourteen years later, 350 Indian men, women and children were killed at the 7th Calvary tent camp at Wounded Knee, South Dakota, after the US army had disarmed them, looking for their chief, Big Foot. One of the survivors, Louise Weasel Bear, quoted in Dee Brown’s wonderful Indian history of the American West, Bury My Heart at Wounded Knee, said: “We tried to run, but they shot us like we were a buffalo. I know there are some good white people, but the solders must be mean to shoot children and women. Indian soldiers would not do that to white children.” By 1891, all native American Indians had been shunted off to reservations, their culture in tatters. PS Sat Feb 4, 2012 One of my best mates, who never comments on my blog, but reads them most of the time, complained that I wasn’t critical in the above post. The reason I didn’t mention the protests at the Lobby restaurant, the ugly scenes and security scare outside and the odious burning of the Australian flag the next day is that my belief is that these events would have never occurred if sovereignty had been granted to the Aborigines. 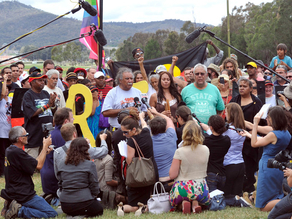 The Tent Embassy would more than likely be a memorial and any anniversary commemorations would be dignified. And Tony Abbott, who spends several weeks every year visiting and helping Aboriginal communities, would not have been asked about the relevance of the site, but only the successful campaign of the Indigenous people in finally achieving sovereignty. We live in hope that someday they shall overcome. Serious question ie not a baiting one. It has never been explained to me just what the claim of ‘sovereignty’ entails. This is Collins on-line dictionary definition. • the authority of a state to govern itself or another state : national sovereignty. See note at jurisdiction . ORIGIN late Middle English : from Old French sovereinete, from soverain (see sovereign ). None of three definitions seems remotely feasible or likely, so is there another interpretation? Just what is it that the 360 or so discrete indigenous tribes want? Whether I agree with it or not, I genuinely would like to know. Magpie, A difficult question, but I will give you my interpretation. From what I can understand, the Aborigines want control of Aboriginal Affairs. And, of course, the Tent Embassy movement is critical of the recently created indigenous representative body, the National Congress of Australia’s First Peoples, and the 22-member panel which presented its proposals on indigenous recognition in the constitution to the Prime Minister last month. I am quoting Dan Harrison, the Indigenous Affair Correspondent for the Sydney Morning Herald here: “The panel proposed specifically recognising the prior occupation of Australia by Aboriginal and Torres Strait Islander peoples, and acknowledging their continuing relationship with their traditional lands and waters, and their cultures, languages and heritage.” It also “proposes prohibiting discrimination on the grounds of race, colour or ethnic or national origin and recognising Aboriginal and Torres Strait Islander languages as ‘the original Australian languages’ and part of our national heritage.” The fly in the ointment is that the panel said the issue of sovereignty should be dealt with separately, which was dismissed by Michael Anderson, the only survivor of the four Aborigines who started the Tent Embassy forty years ago. He wants self-governance as well as compensation. As Debra Jopson (a terrific journalist who you might remember from The Australian back in the 80s) put it in the SMH on Jan 28-29, the Aboriginal anger at the Tent Embassy protests is “about native title laws and land rights acts delivering much less than had been hoped for, about the Northern Territory intervention continuing and about the lack of recognition of these first people in the nation’s fabric, such as the constitution.” That’s what Aboriginal sovereignty means to me. They also want mineral rights to their land, given what they are now worth. I know I probably didn’t answer your question, but I did give it a go. And I still think Aborigines deserve as much sovereignty as we can give them, and it should be proclaimed in the constitution. “While questions relating to sovereignty are likely to continue to be the subject of debate in the community, including among Aboriginal and Torres Strait Islander Australians, the Panel does not consider that these questions can be resolved or advanced at this time by inclusion in a constitutional referendum proposal. So what the expert panel is saying is that “sovereignty” is a “poorly understood concept,” and would be difficult to defend on legal grounds. No wonder Michael Anderson was unhappy with the report.